We generally advice brides to start trying gowns as soon as possible. We work with a minimum of 6 months time frame to custom make a gown. Anything from 10 months to a year is ideal. 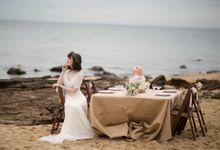 We are inspired by the natural quality of materials; seeing the fabrics in their raw form and transforming them into elegant, free flowing gowns through draping, fabric manipulation and non traditional detail applications. 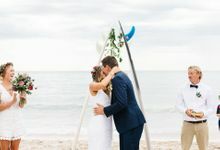 We are a hands on team, creating all designs in house in Melbourne, using an array of luxurious silks, unique laces and intricate beading. When it comes to booking a fitting with us, it is fun, relaxed and personalized. All appointments are private to ensure you get our full attention and feel comfortable and inspired with our stylists. 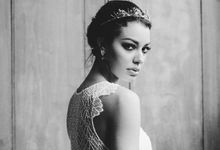 We offer bespoke, custom made and ready to wear bridal gowns, as well as beautifully hand crafted accessories, including head pieces and veils. 50% deposit on measurements to start the creating process of your gown. This unique bridal label was born in 2011. 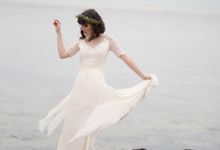 Cathleen fell in love with the elegant simple lines of old world bridal gowns, with intricate beading and layers of lace to create truly stunning designs. Embracing a distinct vintage style with a modern edge. Cathleen Jia is a boutique bridal house based in Melbourne. Offering bespoke, custom made, ready to wear bridal gowns, and unique bridal accessories for the modern day bride. 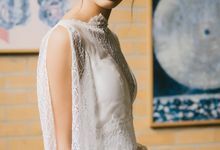 Appealing to the romance in all of us, Cathleen Jia gracefully hand crafts all her designs in house with exquisite fabrics, delicate laces and elegant beading.